Built by a Frenchman who claimed to be a descendant of the Bourbon Dynasty, the Sadar Manzil Gate shows a happy marriage between Asian, Western and Islamic styles of architecture with Gothic influences. Located at the main chowk area, the place was once used as a Public Audience Hall during the princely rule. Today it houses the Municipal Corporation of the city. A walk around the Gate gets you familiar with yet another of the city’s old treasures hiding in an urban pocket! The place is open during the office hours of the Municipal corporation. How popular is Shaukat Mahal? People normally club together People's Mall and Taj-ul-Masajid while planning their visit to Shaukat Mahal. It is basically a 200 year old Mansion of Nawabs of Bhopal which is now divided among their various descendents. There is nothing much to see as the building is not very well maintained, although the people who live in there are very respectful, polite and fun to talk. This royal building is situated at the entrance to the Chowk area in the heart of the walled city. Shaukat Mahal is a 19th century palace which was designed by a Frenchman, said to be a descendent the Bourbon kings. It combines Indo-Saracenic and Rococo architectural styles. The exterior of the palace is also carved with exquisite floral patterns that give the Mahal a very eco-friendly appearance. 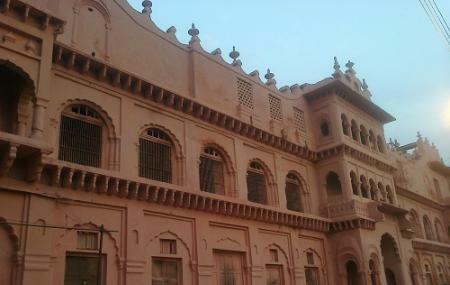 The Shaukat Mahal is flanked by the Sadar Manzil which served as a Hall of Public Audience during the princely period. This brick-red building has an ostentatious appearance, and the gardens that surround the palace makes the Manzil look very pretty. The aesthetical interest of the castle, finish with overwhelming utilization of white alabaster and highlighting a progression of complex triangular molded curves on its roof, was additionally upgraded by flawless outsides decorated with sensitive flower designs giving it an eco-accommodating appearance. Indeed, even following two centuries, the magnificence and wonder of this authentic landmark stays unmatched in the city. Sightseers going to the site are certain to be left totally speechless with its charming magnificence and aesthetic interest. When going by 'Shaukat Mahal', do travel to the colorful red block building 'Sadar Manzil' that encompasses the royal residence. The splendid red of 'Sadar Manzil' impeccably supplements the smooth white development of 'Shaukat Mahal' and the rich gardens here further add that touch of greenery to the postcard culminate setting of these two excellent structures. Numerous a times, exceptional qawwali programs are additionally sorted out in the patio nurseries amid nighttimes. The background of flawlessly lit 'Shaukat Mahal' gives that mysterious feel to the entire environment. In the event that you get a shot, do go to this melodic execution and absorb your souls the Nawabi spirits of Bhopal. PeAce ... A short walk around .. taking in the beauty of old architecture .. definitely a landmark to visit. . after that. A boating on the nearest lake .. ReLax Ur Bhopal mINd ..